Open Your Eyes Hidden Track The three of us, Kevin, Steven and myself, arrived at the concert hall around 19h00, and we were immediately disappointed in two ways: firstly, there were seats in front of the stage, and secondly, the first few rows had already been taken. With the help of a friendly couple who shifted themselves one seat aside, we managed to get three seats somewhere in the middle of the seventh row. As it turned out, they weren�t bad at all: we had an excellent view on the stage, the players and the lightshow. 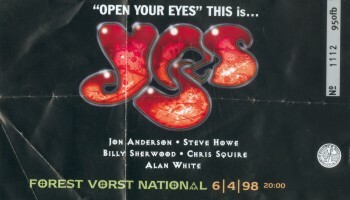 While the Open Your Eyes Hidden Track played, we looked around and spotted several Yes T-shirts, among them two Union T-shirts. There were also quite a few Genesis (they had given a concert a month earlier) and Pink Floyd T-shirts. The people right in front of us were talking about Marillion; in French, so we couldn�t really join the conversation. Despite a frantic search, we were unable to pick anybody with an Alan Parsons T-shirt. Most people in the hall seemed to be around forty, and while there were younger people, even some children, we, aged 18, 19 and 19, were among the youngest in the hall. Another thing that got my attention was the number of women present: more than on a `normal� concert, although they were still in the minority. In some cases, like the couple at my left, it was the husband who came to the concert and the wife who had to come along, in other cases, like the friendly couple at Kevin�s right, it was definitely the other way round. Firebird Suite At 20h05, the finale of the Firebird Suite began. People started to clap and shout, and as the lights in the hall gradually dimmed, the lightshow came to life. It had a beautiful ``warp�� effect: a lot of little specks on the ```walls�� of the stage, and they went from beneath to above, so it looked liked we were indeed travelling through space. During the soft parts, there was some noise on the tape, but during the loud parts, the sound was great. The group came on stage, Igor Khoroshev wearing a hat, and Jon Anderson gave the last part of the tape some extra power by playing along on the cymbals. Siberian Khatru Steve Howe launched into Siberian Khatru, followed by Alan White, Chris Squire and the other guys. To my relief, they didn�t just play the Keys To Ascension-version, but they changed here and there some little things. Steve was doing great, making weird faces as he was totally occupied with his playing. Jon Anderson, smiling all the way, sang like he always does, giving no hint of the problems with his voice he apparently did have. Chris Squire was the beast on stage, jumping and playing on one leg, and he would continue doing so during the whole concert. The lightshow made the experience complete, with some really psychedelic parts, especially during the ``Ta dodaada��-section: every syllable got its own colour, changing at the very moment they were pronounced. The performance was rewarded with a warm applause. Rythm Of Love Next was Rhythm Of Love, the first of the two Trevor Rabin-era songs Yes would play. Billy Sherwood now had one of the few opportunities to show his talents, and he more or less did so. It�s my opinion though that Yes should either a) put away with the whole Trevor Rabin-baggage, or b) make clear to Steve Howe that he is a professional guitarist and thus shouldn�t moan about playing one or two songs that he didn�t write himself. I mean, Trevor and Steve aren�t rivals, they should complement each other; and anyway, Steve is capable enough to handle Trevor�s stuff. Whether Yes choose a) or b), they should put Billy back where he belongs: in the producer�s chair. Billy isn�t bad (at least I didn�t hear him playing a bum note :-)), but he just sort of doesn�t fit in. Yes is essentially a five-man group, and Billy makes six. It was my second Yes concert this year. Last month (March 9), I saw them in Utrecht. But this time, in Brussels, it was five minutes from my home! This time, everybody could sit down. Another concert I remember, with seats everywhere, was the ELP concert during the "Black Moon" tour, in 1992. The reason for this was the small number of people, in comparison with the theatre capacity. Maybe it was the same reason for this time (newspapers here talked about "only" 3000 people). Anyway, it was nice just to sit down and relax, on the 7th row, right on the central places. First, the overall performance was better here. After the wonderful versions of "Siberian Khatru", "America", "Revealing Science Of God" they played in Utrecht, I never thought they could do better here. But they did! As in Utrecht, the song that made me thrill the most was "Revealing Science Of God". But it seemed still better here! When a band can reach this level of perfection, you just feel the last performance is the best. "Rhythm Of Love" was far better played here than in Utrecht. So were "Owner Of A Lonely Heart" and "Roundabout": more energy, more conviction, more inspiration. The only exception was a disastrous version of "Open Your Eyes"! I like the studio version, the way the vocals are constructed, the evolution of the different verses. But they played it without enthusiasm and all the good moments of the studio version had disappeared. Please, guys, show more conviction when you play new stuff! Believe in it! Don't accelerate during the "I believe" part. Let Chris sing alone during the first "It's time to face reality" (on the album, Billy adds his vocals only on the second verse, so that the vocal harmonies appear progressively). All was done too quickly! There were too much keyboards, and I don't think Jon's acoustic guitar added something to the song. That said, it was the only song I didn't enjoy. All the other songs were inspired and there were a lot of intense moments during the show. The sound was also better here, in the big Forest National theatre. In Utrecht, the sound was sometimes too loud (the Vredenburg theatre is rather small), particularly during the encores. Here, it was very clear, even during the loudest parts. For instance, all the solos during the last song, "Starship Trooper", were pretty easy to hear. The keyboards were also better mixed here. In Utrecht, Igor was too low in the mix, but it seems that, since then, the sound engineers realised that his keyboards had to be louder during some parts. It's nice to see that some wrong things were corrected during the last month! The light show fitted better with the music. I noticed some nice colours in rhythm with "Siberian Khatru" or "Revealing Science Of God", things I didn't see in Utrecht. So, again, well done! The set was slightly different than in Utrecht. But these changes happened only during the acoustic part. Of course, Steve Howe began his solo set with "Mood For A Day" and ended with "Clap". But, between this two classics, he only played one song, instead of two songs in Utrecht ("Ram" and "Corkscrew"). Here, it was a beautiful version of "Diary Of A Man Who Disappeared", from his second solo album "The Steve Howe Album" (1979). By the way, I always found that this album was his most achieved work, apart from Yes. 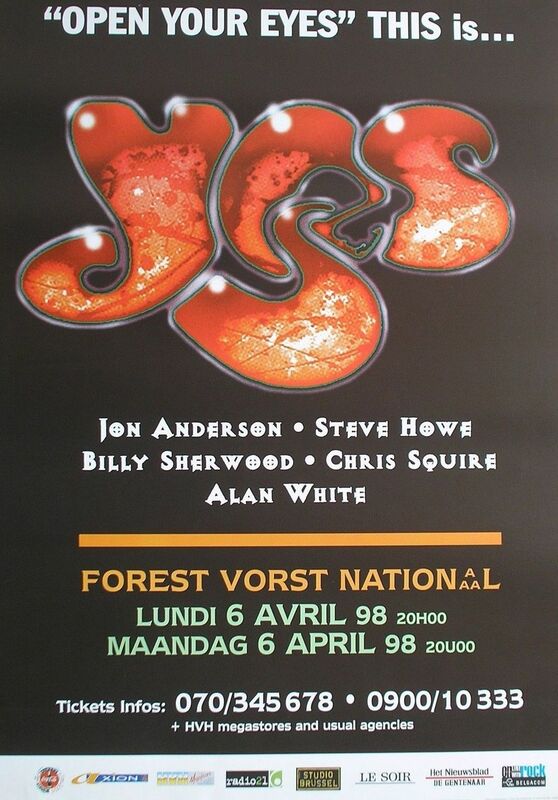 The Yes concert in Brussels yesterday was great. Really ! The band was in communion with their fans. The highlights for me were 'And You And I', 'Bass ,Drums Solos', 'Revealing Science Of God' and 'Starship Trooper'. The rest was great also, of course. -Igor : A lot of talent this Russian guy. Promised to a big career, I hope. -Steve : Nothing to say. Great guitar player. You never know where he's going and that makes it attractive. -Jon : The Voice ! How did he keep his voice so high and clear ? -Chris : You can say he is huge in all the aspects. He really astounded me. What a presence ! And he's 50 ? I know younger people who look like grandpa's, but not him, no Sir. The band seemed happy to play together. The show lasted for almost 2 1/2 hour, but boy ! it seemes too short. Can't wait for them to be back !